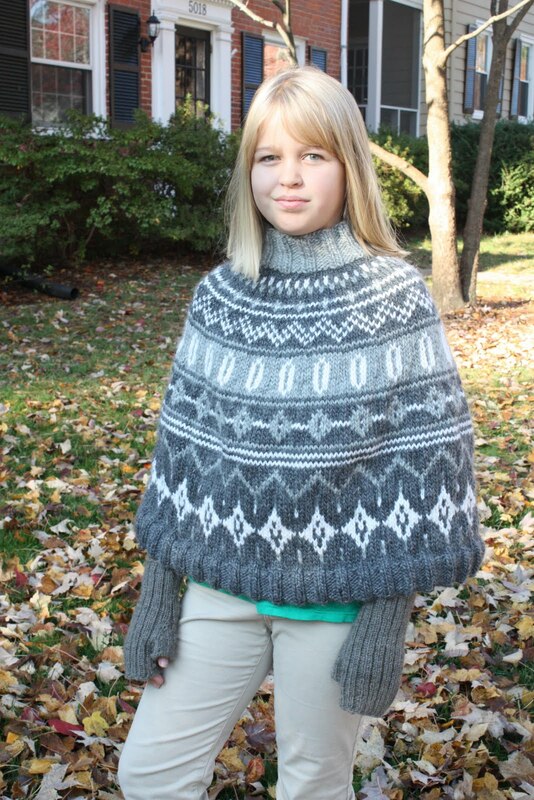 My oldest daughter required a poncho but I had no intention of making a poncho of one color that would quickly, certainly knit me deep into insanity. And there were to be no pom-poms or crazy fringe. I have my limits. After a bit of searching and lots of procrastinating, I found a Drops design for a stunning adult poncho on Ravelry that seemed fun to knit ... and very Norwegian, which we love! Thankfully, my discerning child approved and I set to work. I used Lamb's Pride Bulky and choose a grey color palette rather than brown to complement the grey/blue of my daughter's eyes (3 skeins of Charcoal Heather, 1.25 of Grey Heather, and 1 of White Frost). I could have used a smidge more of the charcoal in order to finish the collar, but she didn't want a very high collar so I used some of the grey heather. 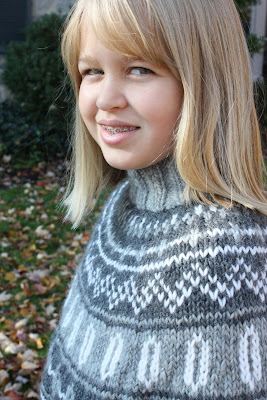 In retrospect, I wish I had found the exact grey color in a super soft, comfy yarn for the collar. My daughter reports that she doesn't like how the Lamb's Pride feels on her neck, so she turns down the collar. 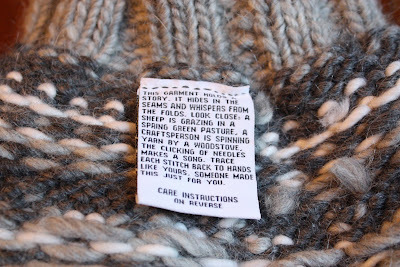 Also, this yarn sheds. I especially noticed it when I knit while wearing my black corduroy pants! In order to achieve the right size (girls 12-14), I CO 252 stitches on US8s. I followed the directions after that so that I had 210 stitches when I switched to the larger needles - in my case US 10.5s. One of my favorite features of this poncho, is the wonderful Homegrown Logo tag from Leafcutter Designs. My friend, Mim, gave me these creative and fun tags for my projects. You must check out all the designs! This specific tag can be found here. (And check out Mim's gorgeous purses made with Ikea cotton and vintage fabrics.) Great present ideas! Aren't the tags dear? Almost a blessing for the garment. My favorite lines: The clicking of needles makes a song. Trace each stitch back to hands like yours. Someone made this just for you.